Soldering from SHINE is an important part of your custom cable assembly or wire harnessing project. 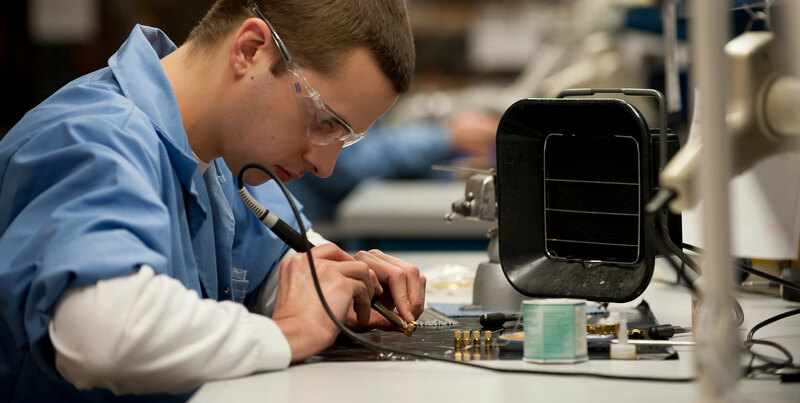 We employ a highly-trained workforce that’s skilled in soldered terminations and solder connections. Our facility is RoHS compliant, too. Soldering forms strong, reliable connections between metal components such as a wire and a terminal. Solder, a type of filler metal with a relatively low melting point, is heated until it flows into the joint. Good solder joints have a smooth appearance that’s free of scratches and sharp edges. As an experienced provider of wire and cable processing services, SHINE follows standards such as IPC/WHMA-A-620 for soldered terminations and solder connections. Good solder joints have a smooth appearance that’s free of scratches and sharp edges. As an experienced provider of wire and cable products, SHINE follows standards such as IPC/WHMA-A-620 for soldered terminals and solder connections. SHINE uses soldering pots or tinning pots for melting solder and tinning the ends of lead wires. The American Beauty solder pots that we use provide reliable temperature control and support precise temperature settings for solder or tinning projects. Soldering irons are handheld tools with a heated metal tip and an insulated handle. Typically, they’re used in very low volume production. Soldering stations like the 25+ Oki / Metcal units used at SHINE offer numerous advantages. For example, they support various sizes, shapes, and temperature tips for most any solder-related requirement. SHINE is an ISO 9001:2015-certified electronic contract manufacturer of custom cable assemblies, wire harnesses, and electro-mechanical assemblies. Since 1984, we’ve been providing partners with wire and cable products that exceed their expectations. How can we help you?